Making Jimmy Olsen hot is one of the best things Supergirl has done. I don’t mean that in the eye-candy sense — although Mehcad Brooks is one handsome man — it made him interesting and a substantial character within the show’s world. He is, like Kara, connected to Superman. He’s even connected to him in a way that remains incredibly, admirably true to the kitschy Silver Age comics. He’s Superman’s best friend, the guy who gets to hang out with the most powerful hero the world has ever known. He even has a direct hotline to the guy strapped to his wrist. James Olsen is awesome. One of the worst things Supergirl has done, on the other hand, is immediately tie him up in a relationship for the most whiplashed love triangle I’ve ever seen. “Red Faced” is a relatively straightforward episode, content to spin the handful of plates Supergirl has already introduced without introducing any more. This would be totally fine … if one of those plates weren’t named Lucy Lane. At this point, Lucy seems like a human road block, only there to keep James and Kara apart. Otherwise, they’d immediately fall into one another’s arms. But there is hope for Lucy, maybe, when we get a glimpse of her day job as legal attaché to her father, General Sam Lane. 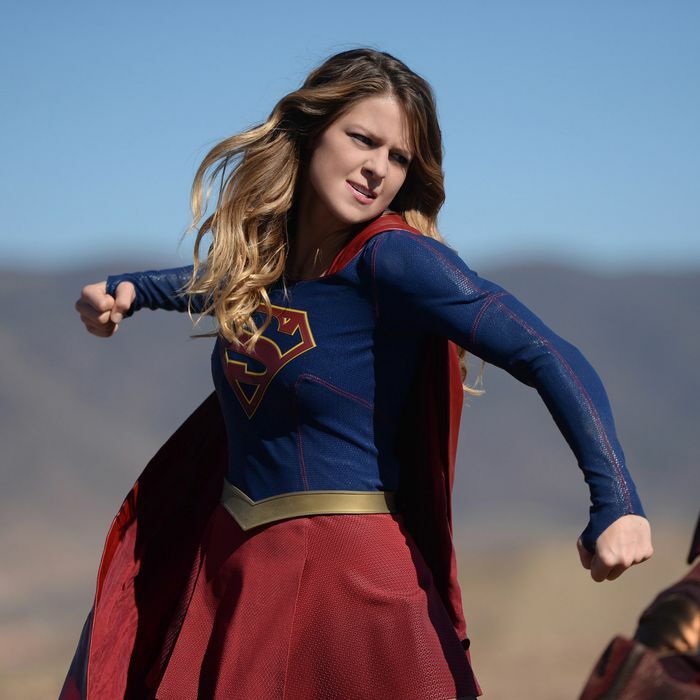 General Lane is here to throw his weight around the DEO, demanding that he have access to Supergirl in order to test a new military weapon — an android dubbed the Red Tornado. This is where comic-book fans can pause and enjoy the moment: They actually made Red Tornado work on a live-action television series and he works JUST LIKE HE DOES IN THE COMICS AHHHH. General Lane wants Kara to fight the Red Tornado to test his combat readiness. Although Hank and Alex stress that she doesn’t have to, Kara agrees — partly because General Lane likes to swing his authority around, which makes life difficult for people who won’t let him have his way. That won’t happen for another day, so before we get back to that, let’s talk about Kara. See, she’s been getting a bit angry lately. The episode begins as she stops two road-raging jerks from crashing into a class of schoolchildren — but when she saves the kids, she also wrecks the cars. That angers one of the drivers, so he throws a punch at her. She stops the punch, of course, but follows up by breaking the jerk’s arm — on camera. This earns her a reprimand from Hank. She’s not allowed to have a temper; the world is full of terrified people who worry that she or her famous cousin might have a bad day and devastate the planet in some terrible way. This is not an easy thing for Kara to hear, and it’s only the beginning of her frustrations. See, James invites Lucy to Kara’s game night. (He’s paying the unwanted company thing forward after Lucy invited him to dinner with her dad, who already doesn’t like him because of his relationship with Superman.) This makes Kara quietly stew. While Lucy and James appear to do great together during their round of Taboo, Winn and Kara just sort of stumble along and she has to listen to Lucy talk about why she thinks Supergirl isn’t that great. Kara is a nice person, so doesn’t do much about this — except bottle it up for her fight with Red Tornado the next day. She goes too far, rips off one of Red Tornado’s arms, and causes the android to switch into panic mode. It flies off to stealth and safety, becoming a threat to all of National City. An infuriated General Lane blames Supergirl, then demands they find and scrap Red Tornado. But this distresses Red Tornado’s creator, Doctor T.O. Morrow. (GET IT?) He still thinks he can fix the android. Meanwhile, a subplot brews at CatCo involving Cat Grant’s mother, who turns out to be an even bigger jerk than Cat, with pretty much none of her daughter’s redeeming qualities. (She pretty much tells Cat to not bother getting dinner with her, then barely shows any interest in her grandson.) Cat directs her frustration towards Kara, making her work late and berating her a bit more than usual, but because Kara is having a lousy couple of days in just about every aspect of her layered life, she flips out at her boss. Cat responds by taking her out for drinks. The ensuing conversation is more or less about the patriarchy. Cat tells her they live in a world where men can get mad and are lionized for it, but women can’t afford to be that expressive, lest it damage their professional reputation. I don’t mind when Supergirl has its characters sit and talk frankly about feminist issues. That’s how you do it in real life! It’s when the Bad Guy of the Week bellows out stuff like ON MY PLANET WOMEN KNOW THEIR PLACE — that’s when things can get a bit cringeworthy. Superheroes were pretty much invented for on-the-nose storytelling, but the stories that invite awful dialogue can really cripple cathartic moments. While this really great scene is going on — I should add that the ongoing humanization of Cat Grant is a great subplot — James is stuck at an uncomfortable dinner with the Lanes. Thankfully, it’s cut short by Red Tornado. Kara arrives — that super-hearing really comes in handy — but the android creates a tornado, then escapes while Kara rushes off to save civilians. Back at the DEO, General Lane once again uses the escape of Red Tornado to lean on Kara. (Guy really doesn’t miss a beat.) Hank finally tells him to lay off and the rest of us sigh thank you Hank. General Lane, however, insists on remaining a jerk, and says that Supergirl is no less a threat than the freaking xenomorphs from Alien. Meanwhile, Alex figures out how to track Red Tornado, thanks to a reluctant assist from Maxwell Lord. It turns out that Tornado isn’t as autonomous as we thought — he’s a drone, and he’s being controlled by Dr. Morrow. Morrow is angry at General Lane for wanting to scrap Red Tornado, and wants to get revenge. In a brief pause before the action moves towards its conclusion, Kara takes Cat’s advice and tries to find an outlet for her frustration, which involves working out with James, who is also quite frustrated. He sets up a heavy bag next to a jalopy that’s suspended upright with chains so he and Kara can punch out their frustrations — his about General Lane and Kara’s about … well, everything. Kara totally uncorks. While punching the car’s engine block through the chassis and straight across the garage, she vents about how she’ll never have a normal life, how that’ll always frustrate her, and how she never realized it until just now. It’s a nice scene, and a good setup for what’s to come. The final confrontation with Red Tornado involves luring him into a fight with Kara by using a decoy hologram of General Lane, while Alex infiltrates the location where Dr. Morrow is hiding with the controls. It sets up a great pair of fight scenes, where Alex fights Morrow and Kara fights Red Tornado. (The special effects remain impressive and fun.) Things get out of hand and Alex is forced to shoot Morrow, which should shut Tornado off. It doesn’t, though, and now Kara has to put him down for good. So, she blasts him with heat vision, channeling all of her rage and stress and frustration. She thinks of her doomed planet and dead parents and her exiled life and just about everything else she’s bottled up this episode, then pours it into one big roaring blast that obliterates Red Tornado. It’s pretty badass, but also kind of heart-wrenching. I love it. There are now some threads to tie up — Lucy does the first nice thing ever and tells her dad to lay off of Supergirl, since they are all clearly on the same side. Winn, who was asked earlier in the episode to commit a minor felony and hack the DEO database to find out about what happened to Alex’s father, comes back with a grim answer. The late Mr. Danvers was sent to investigate an alien sighting with one other agent, and it lead to both of their presumed deaths. One of them came back some time later, though, totally fine while taking care to delete every record of what he did and saw. That agent was Hank. And finally, the minor-yet-important saga of Cat’s mother is wrapped up in a scene where the matriarch goes out of her way to yell at Kara for things that aren’t her job to do. Cat sticks up for her assistant in a way that’s super satisfying and also shocking, because it ends on a doozy of a cliffhanger. After Cat effectively kicks her mother out of the office, a glass breaks, and when Kara picks it up, she cuts herself.